If you're new to the craft, you may find yourself searching for someone willing to explain how to read a crochet pattern. Fortunately, reading the pattern for a crochet project isn't as difficult as you might expect. For someone who is just learning how to crochet, choosing the right pattern is crucial. There are crochet patterns for many different types of projects, ranging from home décor to fashion accessories. However, patterns are generally rated by level of difficulty - easy, beginner, intermediate, and advanced. Choosing a pattern that is beyond your ability level sets you up for a frustrating experience. If you're the impatient type, you may also wish to select a crochet pattern that can be completed fairly quickly. A dishcloth, scarf, or baby bib will be much easier to make than an afghan for a king size bed. Crochet Cabana's Comprehensive Crochet Dictionary may also be a useful resource to explain how to read a crochet pattern. This site provides definitions for many crochet terms, along with pictures and instructions for basic crochet stitches. For an example of how to read a crochet pattern, visit Barb's Crochet. By going through a dishcloth pattern step-by-step, she helps novice crafters master the skill of deciphering crochet patterns. As you're working on your first crochet project, remember to check your gauge. If your project needs to be a certain size or you're working with a limited yarn supply, working in the correct gauge is crucial. Crochet a swatch approximately four inches by four inches in the stitch pattern used in the project instructions. 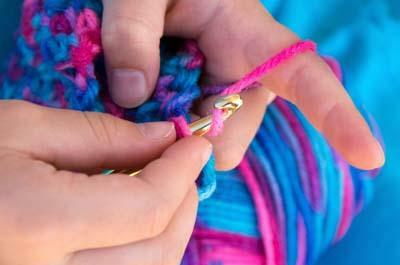 If your gauge is larger than the gauge indicated in the pattern, try using a smaller crochet hook. If your gauge is smaller, however, you'll need to try a larger hook to correct the problem. To follow the pattern correctly, you'll also need to remember to count your stitches as you work. You want to have as many stitches on each row or round as the pattern indicates.